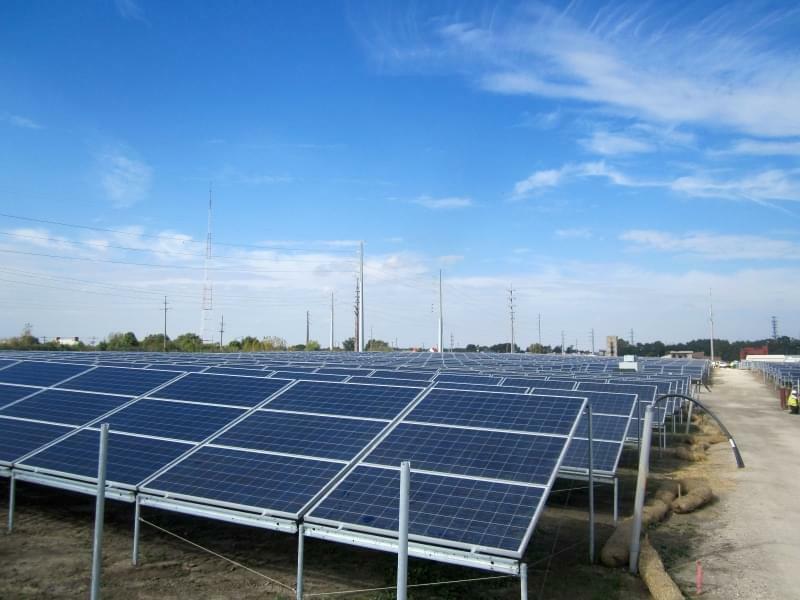 Solar panels installed at the University of Illinois Solar Farm, similar to those that would be installed at the proposed BayWa R.E. solar farm near Sidney. The Champaign County Board voted 15 to 2 Thursday night to allow construction of a huge new solar panel farm on a site east of Sidney. At nearly 1200 acres and with a generating capacity of 150 megawatts, the solar farm would be the largest in the state, even bigger than a 99 megawatt project planned for Perry County in southern Illinois. Some county board members were doubtful about taking so much farmland out of commission, and voiced fears of environmental hazards from the solar panels when the time came to dispose of them. Republican Aaron Esry, who chairs the county board’s Environment and Land Use Committee, said such concerns were overblown. And he said the property owners who would be leasing their land for the project, had the right to do so. The project, to be developed by California-based BayWa R. E., would more than double Illinois’ current solar power generating capacity, which is currently estimated at 80 to 100 megawatts. BayWa’s initial plans called for solar farm acreage to wrap around Sidney, from the southwest to the southeast. But County Board member Eric Thorsland (D-Champaign) says the company listened to the concerns of Sidney village officials about blocking future development. Sidney village officials still opposed the project. And the mayors and village presidents of several small towns in Champaign County have voiced their opposition to solar farms that encroach on their ability to control what development happens within 1.5 miles of their borders. BayWa has obtained Renewable Energy Credits which will allow it to take part in a state program under which the major utility companies in the state must obtain a certain percentage of their electricity from renewable sources. State officials say the program, part of the 2016 Future Energy Jobs Act, is aimed at increasing the state’s solar power generating capacity by thirty-fold, to 3,000 megawatts by 2030.